Figure 1. Location of the Toolik Lake Area (large red rectangle) and Toolik Lake Grid (small red rectangle) within the Upper Kuparuk River Region. Figure 2. View looking northeast from Jade Mountain across an Itkillik II glacial landscape with numerous glacial lakes, kames and kettles. This landscape is much more vegetatively complex than the Sagavanirktok-age glacial surfaces (Fig. 3). Figure 3. 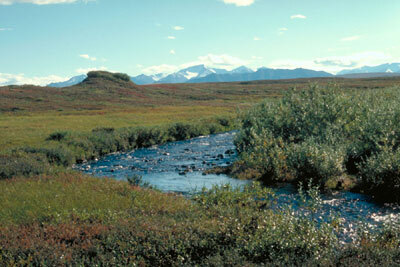 View looking southeast across the headwaters of Imnavait Creek into the Phillip Smith Mountains of the Brooks Range. 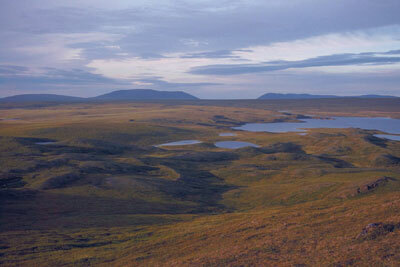 Vegetation is typical of the Sagavanirktok-age glacial surfaces, which cover large portions of Upper Kuparuk River region but do not occur on the Toolik Lake Area and Grid maps. Photo: D.A. Walker. Figure 4. 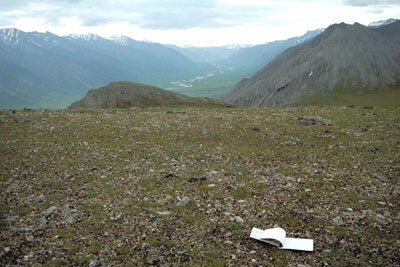 Alpine area on limestone on Peak 1376 in the southeast corner of Map A, looking south into the valley of the Sagavanirktok River. The dominant vegetation is Dryas integrifolia-Oxytropis nigrescens (Unit 10 on the Upper Kuparuk River Region vegetation map). Photo: D.A. Walker. Figure 5. Streamside vegetation along the inlet stream to Toolk Lake. The tallest shrubs are Salix alaxensis. Low shrubs along the far bank are a mix of Betula nana and Salix pulchra. 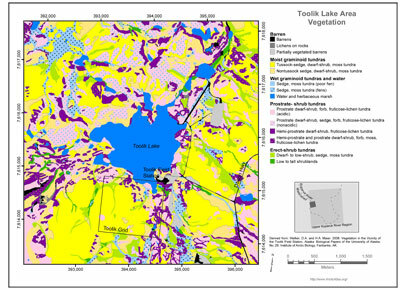 The dominant vegetation unit along the stream is low to tall shrublands, Unit 14 on the Upper Kuparuk River region vegetation map and the Toolik Lake Area vegetation map, and Unit 24 on the Toolik Lake Grid vegetation map. Photo: D.A. Walker. 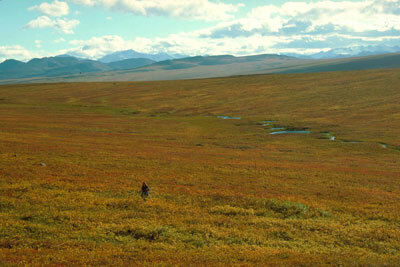 The Toolik Lake vegetation area is located near the western boundary of the Upper Kuparuk River region and encloses a 20-km2 area surrounding Toolik Lake that stretches from the Dalton Highway on the east to Jade Mountain on the west. 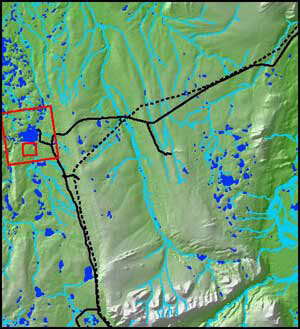 It includes the Toolik Field Station, the old Toolik Lake pipeline construction camp gravel pad and airstrip on the northeast side of the lake and the primary terrestrial research areas on the south, west and east sides of the lake, as well as several smaller research lakes in the immediate vicinity of Toolik Lake. The area contains surfaces with irregular topography that were glaciated during the Late Pleistocene (Fig. 2 and 3). The vegetation map portrays the physiognomy of the dominant plant communities in each mapped polygon. Fifty-one landcover types were recognized in the field (minimum mapping unit approximately 250 m2). These were later grouped into the 14 physiognomic vegetation units on the map, which correspond to the same units on the 1:63,360-scale map of the upper Kuparuk River region.